NOTE: Since Spillguard is manufactured only in 6′ wide rolls, any size wider than 6′ will be made of two pieces that are professionally attached together and ready for use. Spillguard carpet and rug pad is made in a full 3/8″ thickness to add luxury and comfort under foot while protecting area rugs and floors from wear and damage. Spillguard® utilizes DuPontTM Active Layer RS renewably sourcedTM moisture barrier film, which contains a minimum of 20% renewably sourced ingredients by weight. Made in the USA, Spillguard is hypo-allergenic, mold and mildew resistant and is ozone friendly and does not out-gas. Spillguard brings luxury, comfort and safety to your area rugs, your floors and your home. Dense Visco-Elastic Memory Foam cushion for soft feel under your feet. Full 3/8″ Thick padding. Hypoallergenic – ozone friendly (no CFC’s). DuPont Active Layer RS renewably sourced moisture barrier film. Protects your investment by enhancing carpet performance and makes any carpet or rug feel more luxurious under foot. 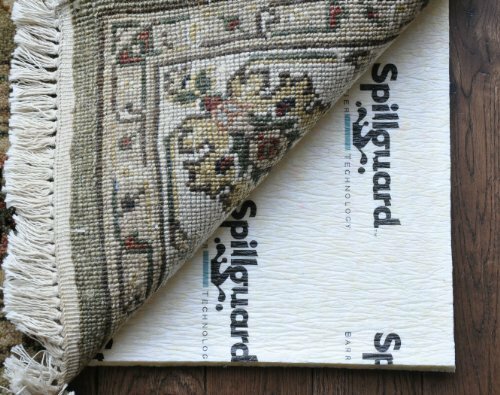 Spillguard moisture barrier prevents spills and accidents from penetrating the cushion, so they can be blotted from the rug quickly and easily. This pad is intended to provide comfort and protection. Does not have a non-slip backing, not recommended for keeping rugs in place. Arrives as two (5’x8′) pads pieced together with a 3″ wide carpet tape.